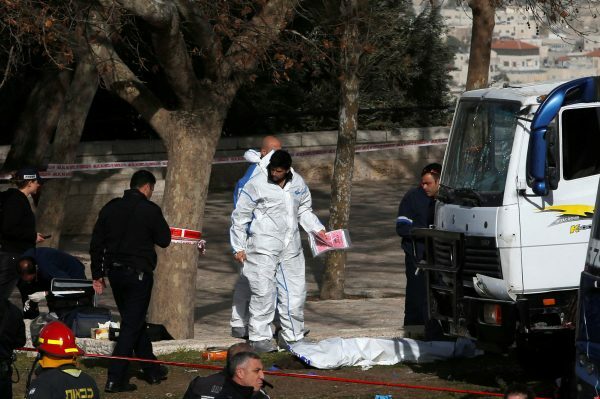 A Palestinian rammed his truck into a group of Israeli soldiers on a popular promenade in Jerusalem on Sunday, killing four of them in an attack that Prime Minister Benjamin Netanyahu said is likely to have been inspired by Islamic State. The military said that a female officer and three officer cadets were killed and that 17 others were injured. Police said three of the dead were women. 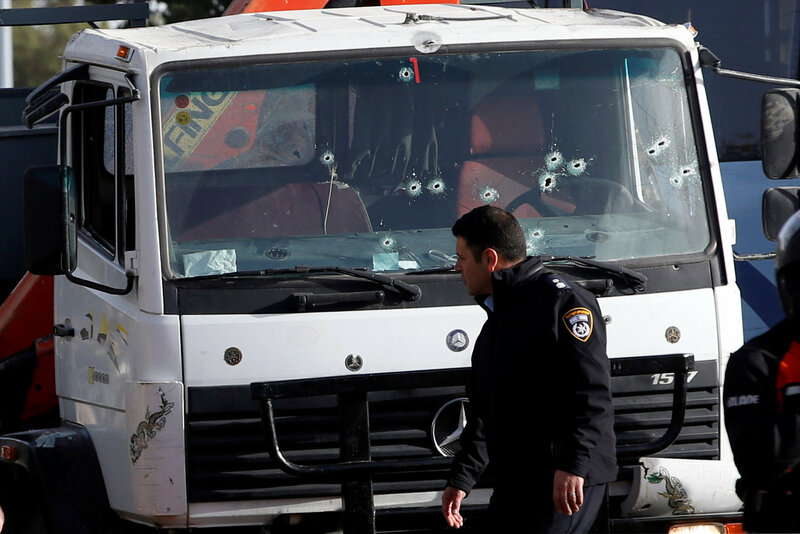 Police identified the truck driver as a Palestinian from Israeli-annexed East Jerusalem and said he was shot dead. His uncle, Abu Ali, named him as Fadi Ahmad Hamdan Qunbor, 28, a father of four from the Jabel Mukabar neighbourhood. Police spokesman Micky Rosenfeld said that nine Jabel Mukabar residents, including five members of the attacker’s family, were arrested on suspicion of aiding the attacker. Netanyahu visited the scene and convened his security cabinet, a forum of senior ministers, to discuss Israel’s response. He said that security forces were controlling access in and out of the neighbourhood. “We know the identity of the attacker. According to all the signs he is a supporter of Islamic State,” the prime minister said. A government source said that ministers had called for the demolition of the attacker’s home and for his body not to be returned to the family for burial. It also decided to detain without trial persons expressing sympathy for Islamic State. The United States condemned the attack “in the strongest terms possible” and expressed condolences for the victims, Pentagon spokesman Peter Cook said in a statement that also reiterated U.S. support for Israel’s security. Roni Alsheich, the national police chief, told reporters he could not rule out that the driver had been motivated by a truck ramming attack in a Berlin Christmas market that killed 12 people last month. “It is difficult to get into the head of every individual to determine what prompted him, but there is no doubt that these things do have an effect,” Alsheich told reporters. In another attack claimed by Islamic State and involving a truck driven into a crowd, nearly 90 people were killed in the French city of Nice in July. Actions inspired by Islamic State in Israel, the occupied West Bank and Jerusalem have been rare and only a few dozen Arab Israelis and Palestinians are known to have declared their sympathy with the group. 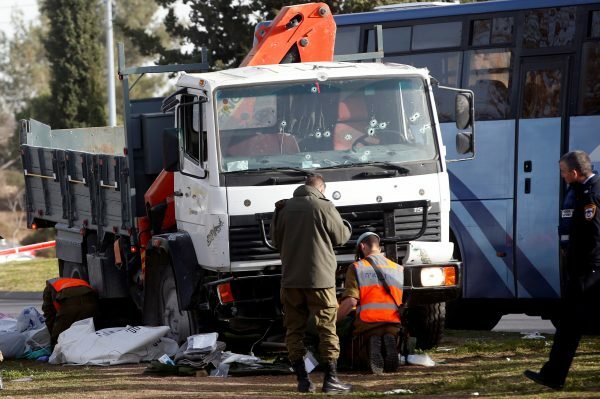 A wave of Palestinian street attacks, including vehicle rammings, has largely slowed but not stopped completely since it began in October 2015, with 37 Israelis and two visiting Americans having been killed in these assaults. At least 231 Palestinians have been killed in violence in Israel, the occupied West Bank and the Gaza Strip in the same period. Israel says that at least 157 of them were assailants while others died during clashes and protests, blaming the violence on incitement by the Palestinian leadership. Hamas, the Palestinian Islamist group that controls the Gaza Strip, routinely praises those who carry out street attacks, and did so on Sunday. “We bless this heroic operation resisting the Israeli occupation to force it to stop its crimes and violations against our people,” Hamas spokesman Fawzi Barhoum told Reuters. Security camera footage showed the truck racing towards the soldiers and then reversing into them. A security guard identified only as “A” told Channel 10 how he shot at the truck and its driver. “I shot at a tyre but realised there was no point as he has many wheels, so I ran in front of the cabin and at an angle, I shot at him and emptied my magazine,” he said. The footage showed many of the soldiers fleeing the scene as the attack took place, their rifles slung on their shoulders. As a Palestinian resident of East Jerusalem, the truck driver would carry an Israeli identity card and be able to move freely through all of the city. Israel considers all of Jerusalem its united capital, a stance not supported by the international community.